You are reading page 4 of I'm a conservative, and i went to an alexandria ocasio-cortez rally. If you want to start from the beginning Go to First Page. I didn't say it would be more expensive. Your anecdotal evidence isn't worth a whole lot. If you're really interested to learn what happens when people are covered by universal healthcare, you could always look up the numbers of how many physician visits per year a person living in such a country makes. Or not. You could just go with your anecdotal stuff I guess. My anectdotal eveidence isn't everything. However, I've worked in a 250 pt per day pediatric ER for the last 4 years, and everyday see several people overconsuming the healthcare system. And life experience has taught me that the less something of value costs, the more people buy or use it. By the way, I find it a bit sad but also quite revealing that you think that quality of healthcare has an automatic correlation to a nurse's or physician's pay. Again, supply and demand. If a nurse or physician salary is closer to something that requires less training and stress, there are going to be less nurses and physicians. And thus, a bigger % of those people aren't the best and wouldn't be good enough to be employed if the competition was better. 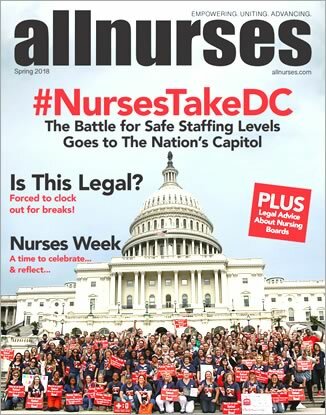 I'm sure many of us know nurses who would do something else, or at least cut back hours on their nursing job and work another PT job if they could do so financially. What has happened to MD and nurse pay in countries with a single-payer healthcare system? And maybe Grumpy and Phil, who have worked, and do work under such a system can join in on the discussion. Perhaps Grumpy or Phil can elaborate on how the U.S. helps subsize their healthcare system by providing most of the world's healthcare research and innovation. Not that it matters much, but my "Medicaid" for all was a typo. As hospitals and physicians are currently paid by a mix of Medicare, Medicaid, private insurance, and cash. When private insurance goes away and is replaced by Medicare, reimbursements are going to go down. Decreased reimbursement $$$ effects supply and quality of healthcare resources. All of us here believe nurse staffing effects quality of care. Does anyone who has worked in a acute care hospital not believe that if your employer receives less reimbursement revenue that nurses will be further understaffed and/or underpaid? Medicaid and Medicare are two very different things when it comes to reimbursement, Medicaid be design only reimburses a token amount, as opposed to medicare which reimburses sufficiently to cover costs as well as provide for some profit. Both private insurance and medicare provide the same basic service; they receive payments, pool it, and then pay out for care provided. The difference is that it costs far more to have private insurers provide that service due to higher overhead. If we put $100,000 towards healthcare through private insurers, only about $88,000 goes towards care, whereas about $95,000 goes to care when we give that same $100,000 to medicare, so I'm not sure how you're coming to the conclusion that there would be less more money for care if we took the money currently going through private insurers and and put it through a system that keeps less of the money for itself rather than patient care. Private insurers don't provide "most of the world's healthcare research and innovation" if your suggesting those wouldn't exist as they do now if we went to a single payer format. It's debatable if we really provide most of the world's healthcare research and innovation, many of the recently developed advanced therapies weren't developed in the US, newly developed pharmaceuticals also aren't predominately from the US, but the advancements in care that have come from US such as error prevention, safety initiatives, etc have come from CMS and CMS affiliated agencies such as AHRQ. Medicare reimbursements are less than private insurer reimbursements. What is your source for this bit of information? Medicare generally reimburses less than private insurers but that doesn't mean hospitals would generally lose money if we transitioned to single payer since they would be getting paid for all the patients they are caring for, not just some of them. More importantly hospitals that currently struggle to provide adequate care due to large uninsured and Medicaid patient populations would see their reimbursements go up dramatically under a single payer system since they would be getting reimbursed for all of their patients, instead of getting reimbursed for only the 10% of their patients with insurance. It is certainly true that some hospitals who currently enjoy a high rate of privately insured payors in their mix would see a reduction in revenue, although this would be unlikely to affect care since their extra revenue isn't currently used for patient care, it's used to pay for premium movie channels and free OnDemand movies for patients, or for fancy meal service and other amenities which there isn't much reason to believe are integral to patient outcomes. So, those hospitals who are going to lose revenue, you believe they are going to stop competing for patients and they will get rid of the pay per view and fancy meals? Or, will they make cuts in staffing and pay? Considering that under CMS they would lose revenue for cutting staffing I think that's doubtful since it wouldn't actually save them money. How about cutting pay? Or other resources? Or you pile in additional responsibility to nurses? The deficit had to be made up somewhere. And, there are ways of cutting staffing without declaring you are doing so. You just don't replace people. I think we would need to look at other countries like Canada. Do they overuse their system and get healthcare when home care would suffice? I do think a lot of our ERs are full of people that aren't emergent. But there are a lot of people with symptoms that need attention that don't go because they can't afford it. How many people with a high A1C or high blood pressure are not getting annual physicals? I will also agree with the idea that quality of care might be sacrificed if suddenly everyone gets health care. The health care system would be overwhelmed, at least in the short term. I think it would all work out in the long run and many things would have to be worked out. People are already doing things like going to pharmacies for health care, going to the grocery store for an online video chat with a doctor, or using an app on their phone. The profits to healthcare would be enormous and the economy would be stimulated. You'd think more people would be into this idea. Especially those that are buying into the idea that "yeah tax cuts need a few years to take affect, but just wait and see"..."yeah the tariffs are going to hurt some people, but in the long run it will be good for the country, just wait and see".